– If you can, move your plant into a larger pot. Choose one that is at least two inches wider, and for larger, vigorous plants, make that four to six inches wider. If you need to use the same pot, remove the plant and wash the pot thoroughly, rinsing with clean water. – Make sure the new pot has drainage holes. Lack of flow-through when watering is the biggest single cause of houseplant problems. Water must flow out of the bottom, to draw fresh, oxygen-rich air into the soil, and to remove excess salts from water and fertilizers. Without oxygen the roots will weaken and even die. Excess salts prevent strong water uptake, causing browning leaf tips and margins, and weakening of the growing points of your plants. – If you use a saucer or outer decorative pot to keep that water off the floor, remember to empty it shortly after watering. If you use a layer of gravel, or those brown light-weight clay pellets, in the bottom of an outer pot, excess water will collect there, so your plant is not standing in water. As that water evaporates it adds helpful humidity too. – Use a suitable potting soil. Never use garden soil for houseplants. For most plants a general-purpose houseplant soil is fine. If your plant is one that doesn’t need a lot of water, try using a cactus soil – the results are often great, even with plants that aren’t technically succulents. For camellias and azaleas, use a lime-free soil blended for acid-loving plants. – Remove the plant from its pot and shake or brush away any loose soil. – If there are a lot of coiled roots in the bottom, cut through these in a couple of places with a sharp knife, to encourage new roots to spread out and explore the new soil. – If there is a single large hole, cover it with some insect screening, or a single stone. Don’t put a layer of gravel or stones in the bottom of the pot. 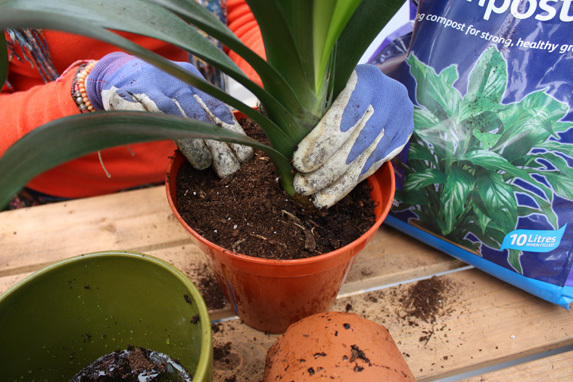 – Place a layer of new soil in the bottom of the pot. So that the top of the root ball will be about an inch below where it was before and add new soil until the pot is full. Leave the top inch of the pot empty of soil to make watering easier. Don’t press the soil down hard – just gently push it into place. – Either stand the pot in a bucket of water until it is thoroughly wet, or water from above with a fine rain of water, until plenty flows out the bottom. If you have a large plant that can’t be removed from the pot, then scrape out any loose soil from the top, and replace it with fresh, new soil. Potting soil shrinks, so there will probably be several inches of space available for this. Fertilizer is the secret to good houseplants. Regular feeding with a water-soluble fertilizer mixed into the water is best, because it permeates throughout the soil. Time it to be part of your regular watering schedule, so that you don’t over water. The more light your plants receive, the more fertilizer they need, so in a well-lit spot you can feed every two weeks in spring, then monthly through summer and fall. In darker spots, every month or two is about right. Use a fertilizer that matches the type of plant you have, although for most plants a general-purpose food is fine. Like you, your houseplants enjoy a nice clean-up. Remove neatly any brown or dying leaves and trim out any dead twigs. If some growth is too tall, you can usually cut it back to a side-branch or a leaf and it will bush out. If you can get your plants into the shower and give them a wash with cool water, great – they will love it. If not, put a drop or two of detergent into a bowl of cool water and wash the leave with paper towel dipped in the water. This is great for plants with large leaves. Leaf shine products can be used to remove water spots, and increase the gloss, but only on the upper surfaces. If you have a balcony or terrace, houseplants love a holiday outdoors during the warmer weather. It may be too soon just yet, depending on where you are, but keep an eye on the night temperatures. Once they are above 50 degrees, your plants will be safe outdoors. You can even start standing them outside during the day, and bringing them in at night, if it is still too cool. You will be amazed what some time outdoors will do. Birds and beneficial insects will clean up a lot of pests for you, and the extra light and damper air encourages lots of growth. Just be careful not to change light levels too much. If they have had a lot of light in summer, many plants will be shocked, and drop leaves, when you bring them back inside again, where light levels are a lot lower. A shady but bright spot is better than a sunny spot for most foliage plants. Plants like citrus and fig trees should get as much sun as possible during their time outdoors, to encourage flowers and blooms. These simple steps really make a big difference, and your plants will thank you for them. Houseplants don’t need a lot, but they sure appreciate the care we do give them.